Chiropractic is a profession which addresses the care of the human frame and nervous system as a means to promote health. Chiropractic was founded in this country by D. D. Palmer in 1895. There are references to “bone-setting” techniques in Egyptian hieroglyphics, Chinese Tui Na, etc. However, D. D. Palmer was the first to incorporate a philosophy and reasoning process for its application. D.D.’s theory was a simple one. He believed that the brain was the controller of the human body. It communicates with this body through the nervous system. Below the skull, the body of the nervous system is housed, protected and distributed by the spinal column. From the centrally located spinal column, nerves branch out to feed every organ, tissue and cell in the body. D.D. further hypothesized that aberrations or changes to the spinal column, those which put pressure on the origins of the nerves, called nerve roots, will alter the nature of the messages carried by these nerves. Those changes can be positional, degenerative, arthritic or discal, and create in the body a condition he coined “dis – ease”. Positional changes include changes in alignment, such as rotation, or changes in normal curvatures including scoliosis. Degenerative changes can be arthritic, degenerative joint disease (DJD) or discal, degenerative disc disease (DDD). DDD and/or DJD is usually the result of previous long-standing, untreated positional changes or disc injury. Disc injury can occur through wear and tear (microtrauma) or a specific injury like a lifting injury (macrotrauma). 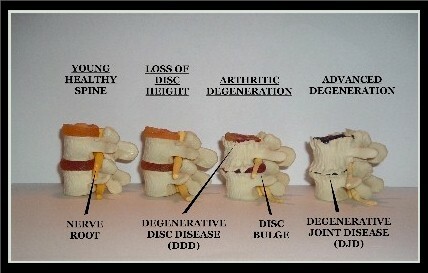 When the disc material breaks through its containing fibers, it bulges against or chemically irritates the nerve roots. These above conditions can exist in mild, moderate or severe manifestations. Symptomatically, they can present without obvious symptoms to full blown musculoskeletal insult. Commonly, chiropractic has been relegated to neck pain, back pain and headaches. While chiropractic is very effective for these conditions, it is really so much more. If we think about D.D.’s original theory, you can see where these neurological insults can be a component of any disease process. * In fact, D.D. was not considering pain as his motivation for developing chiropractic, but was investigating an alternative to what he considered overzealous medical intervention. He names this entity, which was the core of his study, the Vertebral Subluxation Complex (VSC). D.D. determined the origin of the VSC to be traumatic (micro/macrotrauma), biochemical (nutritional/hormonal imbalance), or emotional (stress) and set about investigating his theories. D.D.’s first patient was a man named Harvey Lillard. Harvey reported to D.D. that he had lost his hearing some years earlier and associated it with an injury he had sustained that was accompanied by a popping in his spine at the time of the injury. What a perfect first patient, made even better by the fact that D.D., as history shows, was able to restore some or all of Harvey’s hearing. Harvey was truly the right patient at the right time! This encouraged D.D. to continue. His next patient was one with cardiac problems and again D.D. had a positive effect on this problem as well. Notice that in these early patients, there was no mention of neck or back pain. The approach was solely concerned with promoting health without the use of drugs or surgery. This being said, it is not 1895 anymore. There are so many challenges in our environment from the chemicals in our air, food and water to the over-processed, denatured, nutritionally counterfeit food we consume that subvert our ability to maintain health. Because of these stresses and others of modern living, the more organic, disease changing results, while seen, are not as prevalent in adults, but can still be seen in children. The younger ones have not had decades of insult to their bodies and a wide variety of childhood problems respond to fine tuning the nervous system with the chiropractic adjustment. At the Asian Institute of Healing Arts we focus on the Gonstead method of chiropractic. This method was named after its developer, Clarence Gonstead, who practiced between 1923 and 1978. A graduate of Palmer College of Chiropractic, Dr. Gonstead opened his clinic in Mt. Horeb, Wisconsin, where his reputation spread locally, nationally and ultimately worldwide. In 1964 his practice and reputation had grown to the point where he then built the largest chiropractic facility in the world. This facility was a 22,000 square foot clinic with eleven adjusting rooms, x-ray and labs in-house and a lower level dedicated to classrooms for teaching seminars held there. The lobby of his clinic had seating for over one-hundred patients, the clinic had a seventy-eight room hotel attached to it and a private airstrip for convenience. Quite impressive for a farm community of twelve-hundred citizens. When chiropractic is given without the benefit of quality x-rays, it is essentially a guess. At Asian Institute we prefer not to guess about our patients’ health and do so by gathering as much objective information as possible. The second step in the information gathering process, is the use of an instrument know as a Nervoscope or Tempo scope. This instrument is a finely calibrated thermocouple which is highly sensitive to the presence or absence of heat. When a nerve root is irritated, it can develop inflammation (heat). This inflammation will be detectable along the skin surface and the Tempo scope is designed to locate these areas. This instrument is similar to thermograph, which takes a picture of heat patterns, and has been in use in the chiropractic profession since its infancy. A careful and thorough case history is taken at the Asian Institute. This is a complete and far reaching discussion of the origin of your particular problem and your health history in general. This discussion is an important tool in uncovering underlying problems and contributing sources of illness. Sometimes seemingly unrelated events can be very significant to a practitioner piecing together the puzzle of illness or injury. Part of the case history is a complete musculoskeletal exam. This exam can include orthopedic tests, neurological evaluation and a chiropractic exam. The chiropractic exam will include gait and postural evaluation. 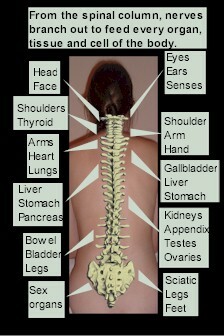 In addition, the movement of the spine itself will be evaluated by feeling (palpating) the spine at rest and in motion. The focus and strength of the Gonstead system is to be as specific and precise as possible. Gonstead work looks for those areas of the spine which will unlock and improve its function by addressing only those areas where there is a problem. The old adage “if it ain’t broke, don’t fix it”, could not be more appropriate for this approach. By combining the x-ray, instrumentation, case history and exams, the doctor specializing in the Gonstead system has a clear and objective picture of what is needed to restore and maintain the optimal health and function of the human body and frame. The doctors at Asian Institute of Healing Arts, P.C., both recommend and utilize a company called Foot Levelers. Just as the integrity of a building depends on the strength of it’s foundation, the body’s structural integrity starts with it’s foundation. No matter how good the quality of footwear, any shoe is built to fit an average foot. Who’s foot is average? The first advantage of a Foot Leveler’s orthotic is the ability to customize the footwear to the individual. Through a structural and gait exam, along with a custom casting, the Foot Leveler’s orthotic is developed through our office. The use of the custom orthotic modifies the footwear from a generic shoe, to a shoe that is specific to the wearer. The orthotic is made of varying materials which control moisture, allow for shock absorption and proper positioning of the foot in the footwear. There are supports build in for all the major structural components of the foot (arches and joints) and corrections for any biomechanical abnormalities present. These factors: reduction of shock, correction of abnormal mechanics and support of the function of the foot, all contribute to an improvement of the structure above. The strength of the foundation improves the integrity of the structure. Foot Leveler’s orthotics are highly recommended for athletes, people on their feet all day and those that spend their days on concrete. Unlike other orthotics, there is a very high level of satisfaction, usage and reordering of the Foot Leveler’s orthotic.